Select small roots of celery. Wash them well with a brush. Make square incisions then place in the oven sprinkled with olive oil and bake for 2 hours or more, depending on the size, until completely soft. Check with a knife to make sure it cuts in smoothly. Take the baked celery roots out and let cool. In the meantime peel and core the pears. If not ripe and soft then saute in a pan with some butter until soft. Sprinkle with a few tablespoons of white wine. Peel the skin off the celery then run the interiors through a meat grinder along with the ripe or cooked pears. Combine with spices. Then add a small amount of breadcrumbs to make the filling more dense. Combine the ingredients for the dough. Seperately for each color. Mix, knead and stretch. 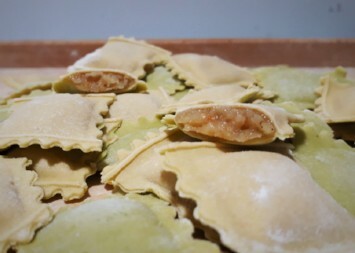 Fill the ravioli using a chosen technique, placing one color dough at the bottom and the other on top.